New Zealand police described efforts to identify the victims as “detailed and complex work” that must be completed thoroughly. “It’s vital we have certainty around cause of death for any future court proceedings,” Detective Superintendent Peter Read said. “We acknowledge that the last 48 hours have been the most horrific in these families’ lives. We understand it is an added trauma for them that they have not been able to bury their loved ones quickly, according to their religious duty,” Haumaha said. 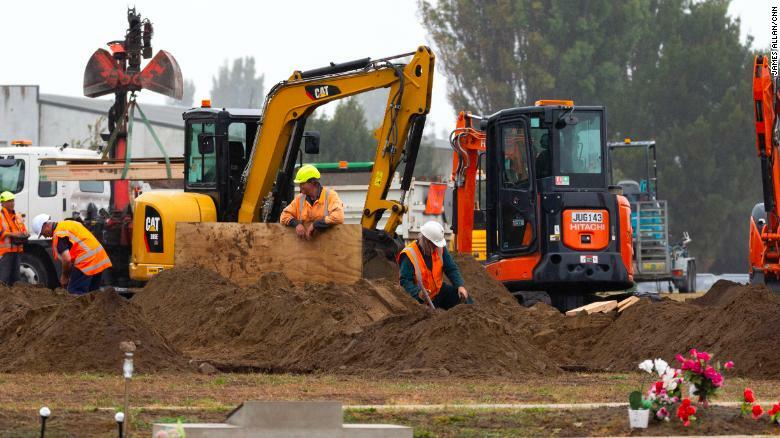 Diggers work behind a white screen fence to dig graves for some of the 50 people who died in Friday’s terror attack. The victims’ names were not made public but a preliminary list has been shared with families, New Zealand Police Commissioner Mike Bush said Sunday. “While it is a small action, the condolence book offers an opportunity for New Zealanders to unite and express our opposition to hate and state our commitment to the values of love and compassion,” Ardern said. Additionally, all edited versions of the video that don’t show the graphic content were also removed “out of respect for the people affected by this tragedy and the concerns of local authorities,” tweeted Mia Garlick, of Facebook New Zealand. Friday’s video has reignited questions about how social media platforms handle offensive content, with many questioning if companies are doing enough to try to catch this type of hate-filled content. In video of the attack posted online by the shooter, he is greeted as he arrives at the first location, the Al Noor mosque, by a man who says “hello brother.” Less than a second later, the attacker raises his semi-automatic shotgun and fires his first shots. Tarrant visited Pakistan last October and a senior Turkish official told CNN that Tarrant traveled to Turkey a number of times and spent “an extended period of time” there. Turkey is “currently investigating the suspect’s movements and contacts within the country,” the official told CNN. The suspect may also have traveled to other countries in Europe, Asia and Africa, the official added. “I can tell you one thing right now — our gun laws will change,” Ardern told reporters on Saturday. She said the Cabinet will meet Monday to have preliminary discussions on gun policy issues. The Prime Minister confirmed that her office received an email with Tarrant’s hateful, racist manifesto nine minutes before he shot worshipers at the Al Noor mosque. However, the email did not include a time, location or specific details of the attack, Ardern said, and it was given to security within two minutes of receipt.